Land-based, expeditionary anti-ship capability to help U.S. Navy control seas. Neller explained that there was a ground component to the maritime fight and that the Marines needed a capability to control sea space from the shore by being able to attack warships at long ranges. The push for an anti-ship capability builds off earlier U.S. Navy and Marine Corps initiatives to exert sea control together, rather than treating it as an exclusive task for the U.S. Navy. The two branches unveiled a joint concept for operating in contested littoral environments in 2017. While not envisioned for use in high-end combat conditions, the principles have clear implications for contingencies with the Chinese military in the South and East China Seas’ archipelagic geography. Neller described that first iteration of the concept as “the fight to get to the fight,” using Marine Corps aircraft and artillery and rocket systems mounted on ships to defeat adversary anti-access/area-denial capabilities ashore that can threaten the U.S. Navy’s warships. Adding an anti-ship capability to the U.S. Marine Corps’ arsenal would give it the ability to not just defeat adversary shore-based sea control threats, but turn around and assist the U.S. Navy in exerting sea control against that adversary’s own warships. The U.S. Army is also getting into the sea control fight, as the U.S. military re-evaluates the way sea control fits into joint operations. For decades, controlling the seas was viewed as virtually the exclusive responsibility of the U.S. Navy, and that the Navy’s role in joint operations was largely to support other the other services with sea-based air and missile strikes against targets on land. As potential rival navies have grown in size and capability, and advanced long-range anti-ship cruise missiles have proliferated, the ability of the U.S. Navy to assure control over the seas on its own has come under increasing pressure and doubt. Because sea control is critical to ensuring the flow of supplies over long distances, enabling control over airspace, enabling land strikes, and preventing similar strikes by potential adversaries, the traditional roles of the sea and land components are beginning to meld. Two years ago U.S. military leaders began publicly calling on the U.S. Army to build the capability to sink ships from land. Last summer, the U.S. Army fired long-range anti-ship cruise missiles and artillery rockets against a target hulk at the Rim of the Pacific Exercise in Hawaii. 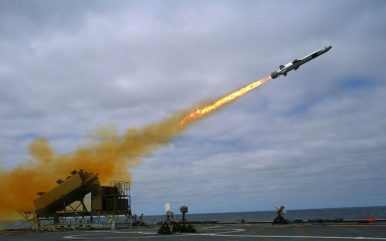 That test involved a ground-launched variant of the Naval Strike Missile, which has already been selected by the U.S. Navy to supplement the armament of its Littoral Combat Ships. While there are no indications yet of the U.S. Army or Marine Corps’ preferences for an anti-ship missile to procure, there are significant logistical advantages for the three services to field a common missile. The Naval Strike Missile also has the capability to be used against stationary land targets, giving it broader utility for the U.S. Army and Marine Corps against a missile that could only be used against ship targets. The U.S. Marine Corps and the Japan Ground Self-Defense Force kicked off their annual Iron Fist Exercise this week.